Quiet, located on the outskirts, is located on the approximately 2. 000 square meters, fully fenced residential land the landlord, the cozy, 2018 built holiday home for up to 4 people. Behind the property begins the paddock of the owners - horseback riding, carriage rides and bringing your own horses are available on request. The nearest bathing lake with paddle offers is approx. 4 km away. The approximately 60 square meters non-smoking holiday home has a living room with fireplace (sofa bed - extra bed for one person, flat-screen TV), a bedroom (double bed, a single bed), an open kitchen (electric stove with oven, fridge with freezer, Microwave, dishwasher, coffee maker, kettle, toaster), a small hallway and a bathroom with shower, toilet and hair dryer. 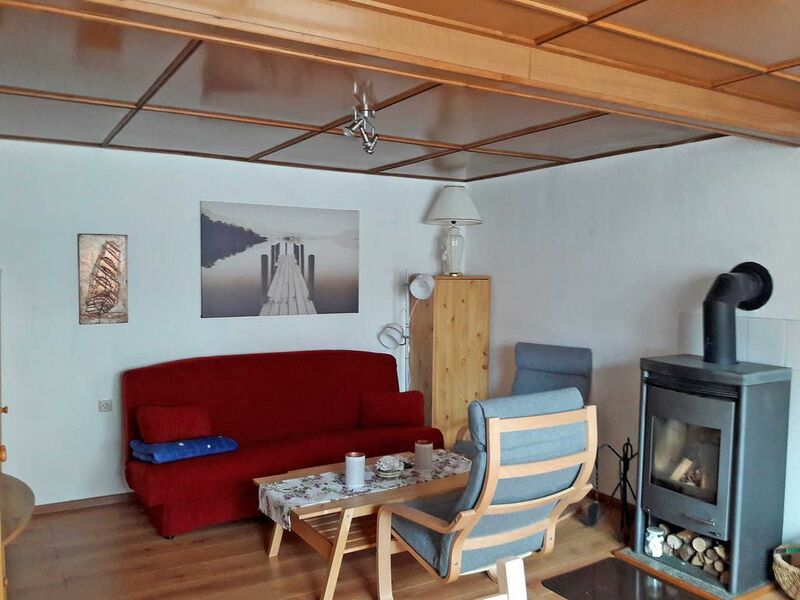 Furthermore, there are a terrace directly from the entrance, another sitting area next to the house, space in the garden, Fahrradabstell- and garaging, parking, barbecue, insect screens on the windows, night storage heaters, a firewood, free Wi-Fi and on request a highchair available. The total price includes final cleaning, water and energy consumption, bed linen and towels. To be paid on site: firewood, pet (if applicable) 15 EUR / pet / stay. In this object, the travel of pets is allowed (15 EUR / animal and stay). The pet must be registered with the booking. If an entry note is not possible, a late registration must be made. Qualzow is a district of the resort Mirow (about 7 km) on the edge of the Müritz National Park. The environment is very rural. Wide fields, meadows, forests and paddocks dominate the landscape. Peace-seeking nature vacationers will find perfect conditions here. Within a radius of about 4-5 km there are several beautiful bathing lakes, which are also ideal for paddling, right on Leppinsee is a canoe rental. The small town of Mirow amidst the Mecklenburg Lake District is located between the royal town of Neustrelitz (about 25 km) and the spa of Waren / Müritz (about 45 km). The city is located directly on the Müritz-Havel waterway and is an attraction for all water sports enthusiasts and hikers. The Mirow Lake is by its connection to other waters ideal starting point for varied paddle tours. The largest attraction of the city is the castle island with the only in June 2014, after many years of restoration reopened Mirow Palace, the 3-Queens-Palais, the idyllic love island, the Johanniterkirche and the Old Palace brewery with adventure gastronomy. In the village there are several restaurants and cafes, a fish smokehouse, shops and boat and bicycle rental.